The 40th anniversary of the death of Elvis Presley is Wednesday. Elvis experts and fans in the area and across the country say the appeal of the man they call The King hasn’t waned. Read about the phenomenon, and see photos of the man himself and those who keep his legacy alive. WASHINGTON — The 40th anniversary of Elvis Presley’s death arrives Wednesday, but fans in the area and across the world say the appeal hasn’t waned for the man they call The King. 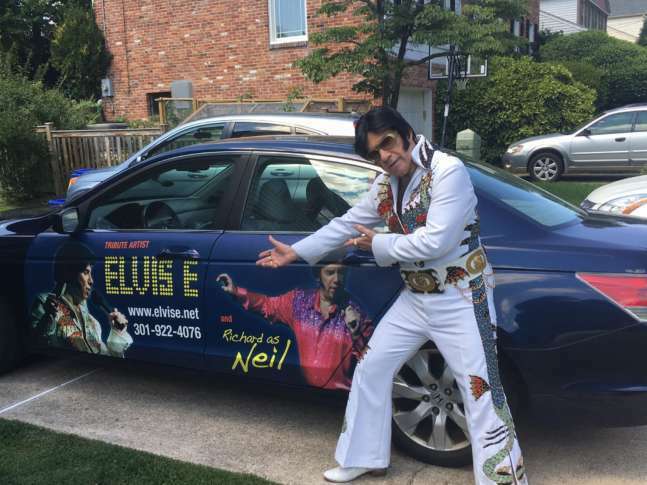 In Potomac, Maryland, Elvis E — who in civilian life, goes only by his first name, Richard — is keeping the Elvis flame alive through his post-retirement career as a Presley tribute artist. It’s not a cheap profession. He owns six or seven jumpsuits, including “The Dragon” replica of a jumpsuit worn in 1974, a jumpsuit from the 1973 “Aloha from Hawaii” concert film, the black leather suit from the 1968 TV comeback special and more. Each jumpsuit costs anywhere between $750 and $1,500. It takes about 15 minutes for him to transform, though Richard doesn’t endure an elaborate psychological transformation: “I don’t have to psych up; I do try to sing” in his decorated car. Richard had some stage experience at record hops and live appearances in a 30-year career as a DJ at D.C.-area radio stations, but he hadn’t sung since the boys’ choir in high school. He began impersonating The King at a karaoke bar in New Orleans during a convention he attended as part of his last job, as an IT worker at a trade association in Alexandria, Virginia. Angie Marchese, at Graceland, the Memphis mansion where Elvis lived and died, said the home embraces such artists as honest tributes that help perpetuate the legend, pointing out that tribute artists, often called Elvis impersonators, were plying their trade even while Elvis was alive. This week, Graceland will host the Official Ultimate Elvis Tribute Artists Contest. Marchese said the key to being an Elvis tribute artist isn’t strictly about looking or sounding the part. Indeed, African-Americans, Asians and women have imitated the King, but the lack of resemblance doesn’t seem to matter. At Graceland, every Elvis Week, as the week of the anniversary of his death is known, is a busy time. But Marchese said “everything’s going crazy” as the milestone anniversary approaches. She said it’s shaping up to be the biggest Elvis Week ever, with “masses of people” headed to Memphis. A lot of people who take the tours of Graceland and pay homage to The King aren’t even 40 years old themselves. That doesn’t seem to matter; the appeal of Elvis Presley continues. “Even though he has been gone for 40 years, he continues to cross generations and to speak to people, just like he did back in the 1950s,” Marchese said. Plenty of artists who died decades ago are largely forgotten — or certainly not remembered with the same kind of fervor as Presley, including many artists whom Marchese acknowledges as great in their own right. She said there are a couple of reasons for that. Nowadays it’s easier than ever to find audio and video clips of the man himself, for younger people to clue themselves in on what Presley was all about. “They get sucked into this lovely world of Elvis, and they find out who he was,” she said. It was also a professional opportunity for Richard, who was 52 when he started off as Elvis E (already 10 years older than Presley was when he died). Richard said he has about 120 songs in his repertoire, all available on his website, but sometimes he gets bizarre requests from audiences, whether it’s songs that Elvis never performed or ahistoric requests, such as to leave his shades on for the entire show. The other factor in Presley’s enduring appeal, Marchese said, is Graceland itself. “Graceland is this physical embodiment of who Elvis was” and a geographical center for people to see artifacts and videos that reinforce and propagate the legend. “A lot of artists — great artists — who passed away 40-plus years ago don’t have that physical place that people can go to,” Marchese said. The estate was left to Elvis’ father, grandmother and daughter, Lisa Marie Presley, who was 9-years-old at the time (her mother, Priscilla Presley, controlled her share for several years until she came of age). It wasn’t just a business move: Elvis Presley was a shadow of his former self in his last years. Upon his death at age 42 on Aug. 16, 1977, he was known just as well for his bloated, pudgy appearance and half-finished concerts as anything else he had done. Preserving Graceland, Marchese said, was a way to reclaim his artistic legacy. Still, the appeal of The King will live on. “There are so many reference points with him” — including the music, the films, Graceland, sunglasses, fat jokes, peanut butter jokes, jumpsuits, Las Vegas, Memphis, sideburns, the phrase “thank you, thank you very much” and so much more, he said.